Gimme ALL the fresh basil and ALL the easy eats. 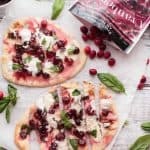 Luckily, there’s no need to sacrifice flavor for convenience because these simple Cranberry Basil Flatbreads with Creamy Burrata are the perfect combo of sweet, fresh and savory flavors. But wait…cranberries…in the summer? YES! It’s totally happening and we are totally here for it. Whether you’re New England born and bred or soaking up California sun, perfect tart cranberries are finally available year round. Thank you to Cape Cod Select for sponsoring this post! You know when you opt for those frozen berries because maybe it’s not quite that season in the year? But then they turn into a soupy mess and you’re wishing you could magic yourself some freshies. Cape Cod Select is solving soupy, frozen berry problems one cranberry at a time. Leave it to a women-owned family business, right? Seriously though, these cranberries come out of the freezer ready to use and defrost perfectly into tart bites of New England joy. 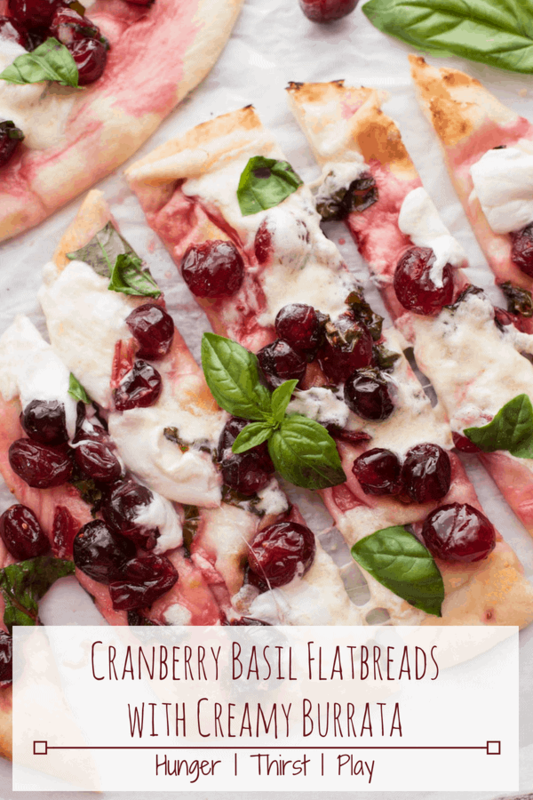 I brought these Cranberry Basil Flatbreads to my mom and dads after making them and the flatbreads disappeared! As lifetime locals, they were thrilled to see the sweet and tart red delights mixed with fresh garden basil in the middle of summer. And the best part? I made these snacks in a flash with minimal effort. Side note: when you’re 34 weeks pregnant in the middle of summer with an active 3 year old, minimal effort is key. Can tastebud bliss be that easy? YUP. 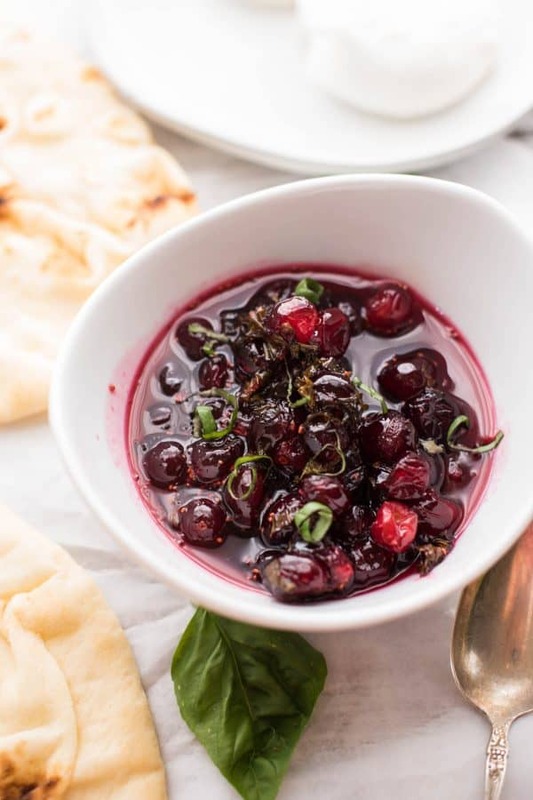 Bring to a boil and simmer Cape Cod Select Premium Cranberries with fresh julienned basil, some sugar and lemon juice. 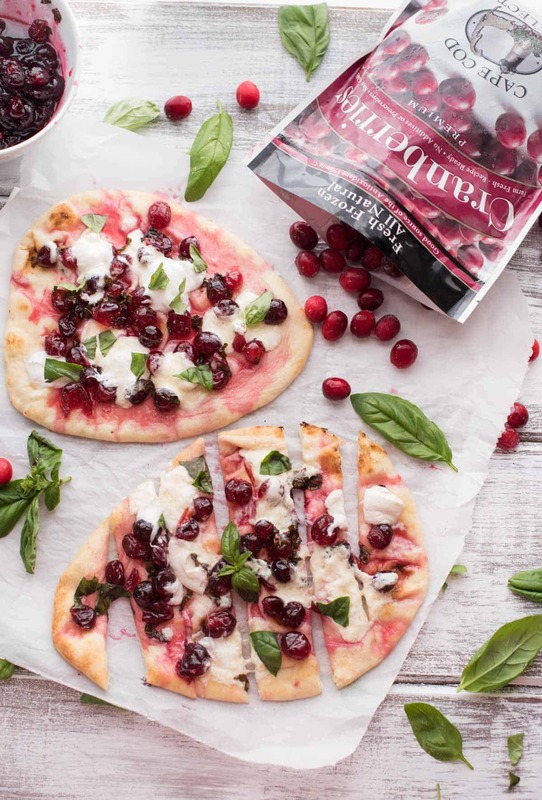 Scatter cooled cranberries over your flatbreads along with torn pieces of creamy burrata. If you can’t find burrata, substitute fresh mozzarella. Burrata really is just fresh mozzarella that’s been taken to heavenly levels by soaking in cream. Warm and bake for mere minutes. 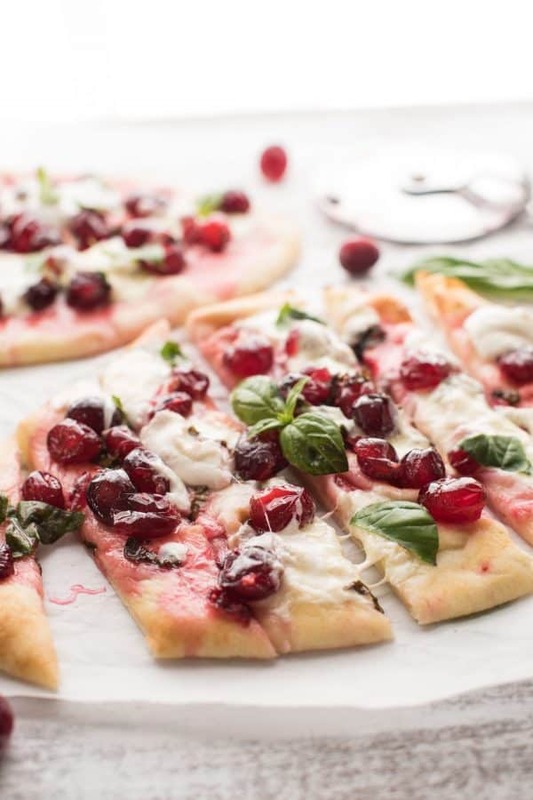 The result is soft and warm flatbread with gooey, melty and savory burrata cheese with bursts of tart cranberries and fresh sweet basil. Want a crispy, pizza like crust? Bake your flatbread plain first, then top and rebake until burrata is melty. Where to get the goods: Have you ever read a recipe boasting about a particular product and then you’re like, “ok now where do I find this?” while simultaneously wiping the drool from your face? Cape Cod Select is making it easy peasy for us ???? You can find their frozen cranberries in a store here OR order frozen cranberries from Cap Cod Select directly. Done and done. Let’s get on to some seriously good and simple snacking. 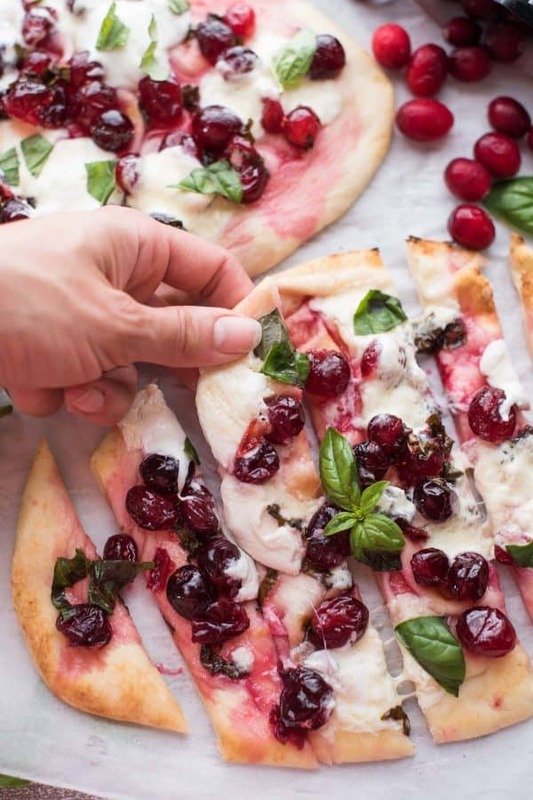 Cranberry Basil Flatbreads with Cream Burrata are easy appetizer that’s perfect anytime of year. Soft, toasted na’an flatbreads, premium cranberries reduced with fresh garden basil and creamy melted burrata. Preheat & Simmer: Preheat oven to 400°F. In a medium saucepan, combine cranberries, sugar, lemon juice and basil over medium heat, stirring until the sugar melts. Boil: Bring to a boil, stirring occasionally, and boil for 3 minutes. Reduce heat to low and simmer for 10 minutes. Let cool 10-15 minutes. Prepare: Place the flatbreads on a baking sheet. Spread the cranberry basil mix on the flatbreads. Tear the burrata apart and scatter pieces over the cranberries. Bake: Bake at 400°F for 3 to 6 minutes. Baking for 3-6 minutes will warm and toast the flatbread. If you prefer a pizza, crunchy style flatbread cook the plain flatbread for 3-4 minutes first then add the toppings and return to the oven until the burrata is melty, about another 3 minutes. This recipe can easily be baked in the toaster oven to avoid baking in the heat of the summer. Follow the recipe directions the same but bake one at a time, directly on the rack. Can I just say that first cranberry explosion in your mouth with a bit of basil is like a piece of heaven. So good, so easy. Aaah…burrata! I love anything with burrata on it. Cranberries sound like a good flavr combination. You had me at burrata! I love a good flatbread option for summer that I can indulge in with my favorite cheeses. The cherries are perfect for the season too! This is one terrific idea!! I’ve seen pears, figs, and grapes on pizza but never cranberries. And not only does it look delicious, it is very appealing to the eyes. I’d love to make this during the holidays in small appetizer portions. Oh . you got me at the word burrata!!! I love how wonderful this sounds. 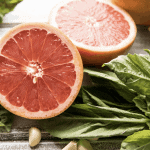 Creamy cranberry and basil are so my kinds of flavors. Saving this for later. I love how when you eat a cranberry they pop in your mouth. The tartness and sweetness I think would be great on a flatbread pizza. This is definitely different, I love it! Thanks for sharing this. This is so creative. we love cranberries and cant wait to give your revipe a try! Burrata and cranberry?!? Yes please! That sounds like a great combination! I would love to sink my teeth into a big piece of this beautiful pizza! Love the unique toppings on this. Two of my absolute favorite foods; burrata and flat bread! This sounds absolutely amazing, definitely going to try this! Wow looks absolutely gorgeous and festive, I love the sweet and savory combo, bookmarking for the holidays!